The WF-LED is capable of producing over 150W of output light. 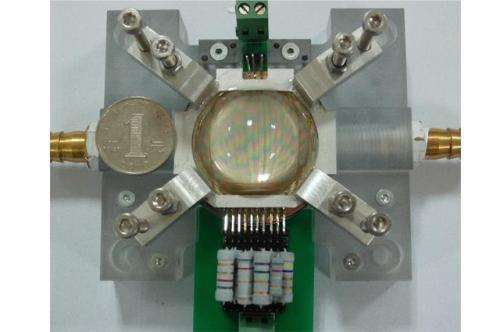 A single wafer-level LED chip that produces more than 150 Watts of light output has been made in work form China. This level of output from a single chip makes applications for LEDs in high power lighting from stadiums to runways feasible, and the researchers have long term plans for a new way to light buildings and towns. The efficiency and long life of LEDs have allowed their use in lighting to spread right into our offices and homes, with unit costs falling all the time. However, the maximum output power of a single LED chip is around 10W, so their use in high power lighting applications requiring kilowatt level output would require hundreds of chips, driving costs above acceptable levels for customers. With the cost of the LED chips falling, the cost of packaging the chips and assembling them with other components to form an LED lamp is becoming more important. The ideal scheme in terms of packaging and assembly costs would be to use one LED chip per lamp, but the limited output power of single chips seriously curtails the use of this scheme. In the latest issue of Electronics Letters, a team from Suzhou Institute of Nano-tech and Nano-bionics, Chinese Academy of Sciences, Xiangneng HuaLei Optoelectronic Co. Ltd. and several Universities in China, report successful creation of a single wafer level LED chip producing more than 150W output, using a single chip assembly approach. In single chip assembly, integrated circuits are created on a wafer substrate as normal, but are then assembled without being separated from the wafer. This approach allows the creation of LED chips with areas a hundred times bigger than the highest-power LED chips previously produced. Such large chip areas normally incur an exponential drop-off in the yield achievable – avoiding this is the key advance of the work reported in this issue. It required a combination of other smaller advances, as team leader Prof. Yong Cai explained: "We developed several technologies, including series and parallel network designs, resistor matching, active liquid heat dissipation and plug-in electrodes, to successfully fabricate this chip." Their series and parallel network design is capable of controlling the yield drop-off even for a chip area covering a whole 2 inch diameter wafer, and the active liquid cooling system they have developed is able to keep the junction temperature below 100°C, even with a 1kW input power. The team also intend to develop the cooling system to allow recycling of the heat energy produced in a lighting system, but this is part of their longer term development plans. They are currently working to improve the wall-plug efficiency (WPE) of their high-power WL-LED chip. "Our preliminary experimental results show a little bit lower WPE – ∼15% – at 1kW. It is expected that when WPE reaches >30%, WL-LED could be applied in real very high-power luminaires. Analysing our results, it was found that the uniformities both of epi-wafer and chip process are the key factors impacting WPE," said Cai. The assembled light source incorporating the WL-LED, shown with a ¥1 coin for scale. As well as working to improve the chip-process uniformity, the researchers are trying to roughen the surface of the chip to improve its light extraction efficiency (LEE) – the efficiency with which the light produced propagates into the surrounding air – and developing a new power supply to match the requirements of the WL-LED. Building on all of this work, their ultimate goal is to explore the idea of a 'centralised light supply system' in which a building, or even an area of a town, is lit by distributing light from a very high-power central source, analogous to central heating systems, or the distribution of electrical power. The idea behind this is to exploit efficiencies of scale in the generation of light at the central source. Such a system would require low-loss light distribution technologies and a very high-power central light source. The team hope that the WL-LED they have produced may prove to be the first step towards this. They expect that much larger chips will be developed over the next decade, up to the size of whole 8 inch diameter wafers, allowing light outputs in the tens of kilowatts. Whether the idea of 'central lighting' will prove feasible or not, it is clear that WL-LEDs have a strong future in more conventional applications of high-power lighting. "LED chip that produces more than 150 Watts of light output" Since when was watts a unit of light, there's no mention of the lumen output. yeah, I want to know what the lumen output is. Still, that thing is amazing size wise. Lumens are a badly-defined unit - the definition is only for a single wavelength of green light. Then that has to be jerry-rigged with semi-confidential curves unofficially specifying the weighting of other wavelengths. The luminous efficiency of common soft-white incandescent bulbs is 2.6% for 1710lumen, 100W, so 2.6W output = 1710lumen, so 1W = 658lumens, 150W = 98,654 lumens, or the equivalent of nearly 58 100W bulbs. That may be an over-estimate for blue LEDs since the eye is a relatively poor detector of that color. With PV on the roof, advanced batteries, and LED's many of us may not need Big Power any more. Building on all of this work, their ultimate goal is to explore the idea of a 'centralised light supply system' in which a building, or even an area of a town, is lit by distributing light from a very high-power central source, analogous to central heating systems, or the distribution of electrical power. That avenue has already been researched with sulfur plasma lamps. They employ a microwave source that excites a bulb of sulfur plasma to create an extremely bright full-spectrum light that is then routed around buildings using light pipes and optical fibers. The efficacy is around 90-100 lm/W and the total efficiency is around 15% which makes it comparable to the LED lamp, except superior in light quality and easily scalable to multiple kW. 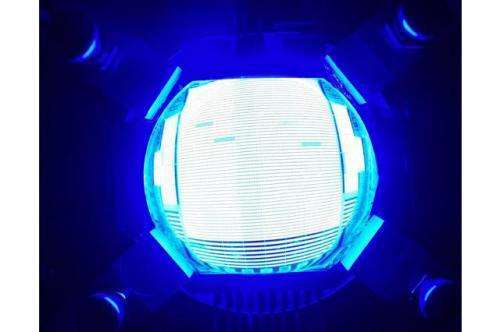 That may be an over-estimate for blue LEDs since the eye is a relatively poor detector of that color. They will use additional fluorescent dyes on top of the light to convert it down to other wavelenghts. That is the working principle behind every "white" LED there is. Didn't you just tout under another article how The Grid is going to solve all the intermittency problems of solar power and anyone who doesn't understand that is ignorant?